The Transparency from Color filter allows you to set the alpha channel (the transparency) of each pixel in the image equal to the red, green, or blue color channel or the grayscale value of the pixel. In Grayscale mode, black pixels (value is 0) become fully transparent, and white pixels (value is 255) become fully opaque. Grayscale values between black and white become partially transparent. This filter can be used to hide or reveal parts of the underlying layer (mask). Use this option to invert the alpha channel (alpha = 255 - alpha). 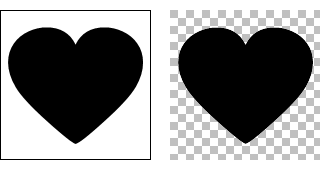 Black pixels (value is 0) become fully opaque, and white pixels (value is 255) become fully transparent. This option allows you to choose the color channel (Red, Green, or Blue) or Grayscale mode. The filter sets the alpha channel of each pixel equal to the chosen color channel or the grayscale value of the pixel.